St. Marys Box Company, Inc.
For over 55 years, St. Marys Box Company of St. Marys Pennsylvania, has been manufacturing a full line of corrugated products. We are a full-service, quality corrugated supplier providing our customers with a complete line of products, including corrugated pallets, and applications. St. Marys Box Co. has been a family owned corrugated business since our start in 1955 as a sheet plant. able to achieve 100% Customer Satisfaction. Corrugated is extremely durable, versatile, lightweight as well as innovative. We manufacture shipping containers, corrugated pallets, packaging material, store displays, and other products. We are able to meet or exceed any of your custom corrugated needs. We have always attempted to be on the leading edge of developing new and innovative corrugated products. 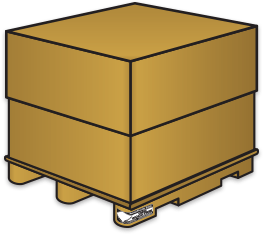 When our customers requested an improved pallet, we developed the LIFT™ Pallet. These corrugated pallets are designed and developed by our internal specialists who have over 115 years of combined experience. To find out more about the LIFT™ Pallet., visit www.lift-pallet.com or click the Corrugated Pallets Link.